I began this blog to record all my yarny things and diety things, which I’ve done (ok, so not all but pretty much so). Looking back it has been a bit hit and miss on the updating front so I think I might extend it to life in general, photos of things other than random crafts and anything else I feel like sharing. I can’t promise I’ll update more often, but I can but try! Christmas and fish ‘n’ chips! Imagine you know all about the things I’ve done between my last post and now. You do? Good! Because that makes me feel better about being so bad at keeping up with this thing. 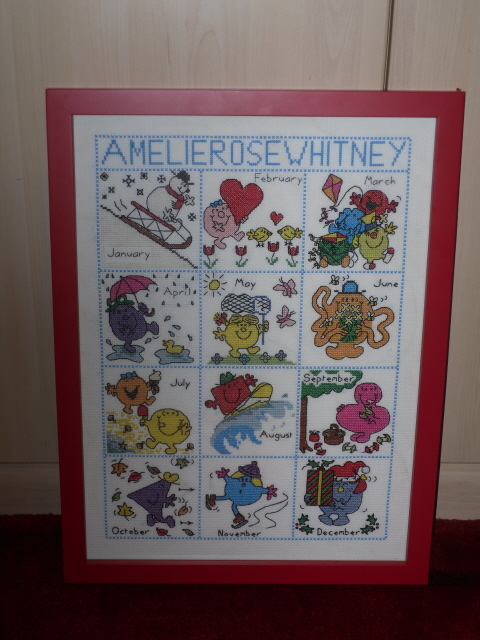 Here is a cross stitch which I did for my niece’s Christmas present because every girl needs some Mr. Men in her life! As you can see I got creative with squared paper and pencils and put her name on the top instead of their generic Mr. Men thingie. It took me ages to work out and I nearly gave up twice, which is why I’m not a designer! I’m on a bit of a charity knitting splurge at the moment. 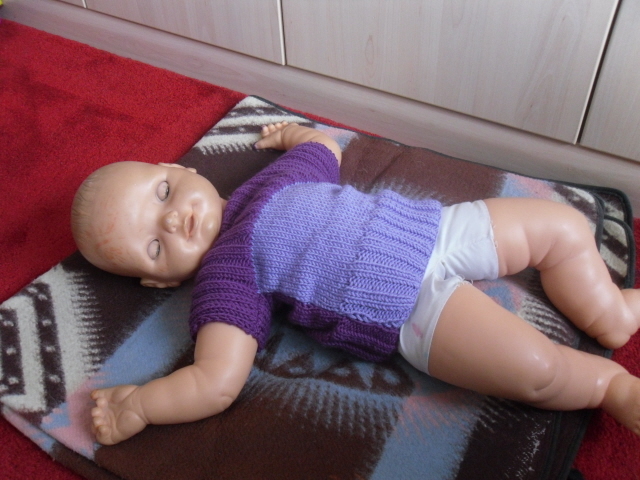 Somebody who goes to the same classes that I do is sending little jumpers to babies in Africa. They’re newborns, often born with Aids, known as “fish ‘n’ chip” babies because the mothers and hospitals have nothing to wrap them in, so they use newspaper. These little jumpers will give them something warm to go home from hospital in. Modelled by my “baby” who is 30 years old and really ought to be able to wash her face by now! P.S. the blanket is from South Africa, my great-grandma gave it to me when I was a baby and I thought it rather apt for the photoshoot!